Even before hackers stole 40 million credit- and debit-card numbers from Target Corp. stores last year, Wal-Mart directors received frequent rundowns from outside consultants on cyberthreats, including gangs of Russian-speaking hackers who target payment-card data, a person familiar with the meetings said. A Wal-Mart spokesman didn’t dispute that account. So far this year, 1,517 companies traded on the New York Stock Exchange or Nasdaq Stock Market listed some version of the words cybersecurity, hacking, hackers, cyberattacks or data breach as a business risk in securities filings, according to a Wall Street Journal analysis. That is up from 1,288 in all of 2013 and 879 in 2012. Still, federal officials and others say many companies remain ignorant of, and unprepared for, Internet intruders. “There may be a gap that exists between the magnitude of the exposure presented by cyber-risks and the steps, or lack thereof, that many corporate boards have taken to address these risks,” Securities and Exchange Commissioner Luis Aguilar told directors earlier this month at a cybersecurity conference at the New York Stock Exchange. via Boards Race to Bolster Cybersecurity – WSJ Article by Danny Yadron. WASHINGTON—Credit unions in search of higher returns are loosening lending standards and piling into longer-term assets, exposing the firms to potentially significant losses if interest rates rise and worrying regulators in the process. Such moves are raising concerns at the National Credit Union Administration, the sector’s regulator, which said a rise in interest rates could make loans and investments unprofitable. Some analysts also said credit unions likely are unaware of the risk they are taking on because they largely avoided the housing downturn. That has raised worries that lax underwriting standards could fuel another bubble. “I am concerned that the message [about rates] is either not getting through, or it’s getting through and they are just choosing not to do anything about it,” said Debbie Matz, chairman of the NCUA, who has long sounded the alarm about the industry’s exposure to interest-rate risk. Credit unions, which have been expanding steadily for years and now serve more than 97 million members nationwide, collectively held $1.098 trillion in assets at the end of the first quarter of 2014. For the lenders, taking on more risk can help boost returns in a low-rate environment. A firm that offers a low-rate, long-term loan might win business over a competitor, and a credit union that invests in a mortgage bond with a relatively longer term can often demand a higher return. But if interest rates rise, the money in those loans or investments will be locked in, generating relatively less revenue than a new loan or investment made in the higher-rate environment. Meanwhile, those banks and credit unions will have to pay depositors higher interest rates, otherwise those customers could move elsewhere. “It’s a double-edged sword,” said Federal Deposit Insurance Corp. Chairman Martin Gruenberg at a news conference last week. Credit unions’ net holdings of long-term assets, a measure of exposure to rising interest rates, rose to an all-time high at the end of 2013 to 35.85% of total assets, according to the NCUA. The increase comes as some credit unions are adopting lax standards for mortgage and home-equity loans and lines of credit reminiscent of those leading up to the financial crisis, according to interviews. Credit unions also are extending the duration on investments like mortgage bonds, regulatory data show. 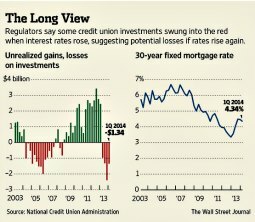 via Credit Unions Ramp Up Risky Lending – WSJ Article by Ryan Tracy, Scott Patterson & AnnaMaria Andriotis. Wal-Mart Stores Inc. is taking another step deeper into banking, rolling out a new money-transfer service that undercuts rivals including Western Union Inc. and MoneyGram International Inc. with lower and simplified fees. The giant retailer on Thursday unveiled the new service, Walmart-2-Walmart, which will allow customers to send and receive up to $900 at a time at more than 4,000 stores. The new service applies only to payments that are sent and received in the U.S. It aims to take a bite of the roughly $900 billion in so-called person-to-person payments made each year in the U.S., often in the form of cash or checks. “This is a relatively easy service for Wal-Mart to develop, because it fits with the customer base that they already have, and they don’t have to spend a lot of money to create, implement or market the service,” said Ron Shevlin, a senior analyst at Aite Group, a consulting firm that specializes in the payments industry. The service launches April 24. 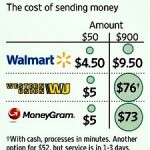 Wal-Mart said the service fees – $4.50 for transfers up to $50 and $9.50 for transfers up to $900 – are 50% or more below the cost of existing offerings. 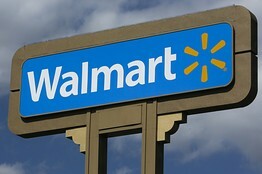 For its new service, Wal-Mart is partnering with Euronet Worldwide Inc.’s Ria Money Transfer subsidiary. 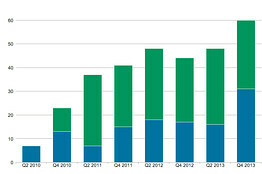 The money-transfer business carries substantial regulatory burdens aimed at preventing money laundering. Wal-Mart has been registered with the Treasury Department’s Financial Crimes Enforcement Network as a money-services business since 2011, according to FinCen’s public database. The move also could place Wal-Mart under the scrutiny of the U.S. Consumer Financial Protection Bureau, which was set up after the financial crisis to police the lending industry for abusive practices involving consumers. The CFPB already has proposed supervising nonbank providers of international money transfers. The vast majority of U.S. money transfers involve sending money overseas, according to payments experts. The U.S. is the largest sender of such payments, accounting for nearly one-quarter of the $529 billion in remittances that international migrants sent to their home countries in 2012, according to the World Bank. In addition to competing with Western Union and MoneyGram, Wal-Mart also is taking on banks that allow their customers to transfer money to other customers. In 2011, J.P. Morgan Chase & Co., Bank of America Corp. and Wells Fargo & Co. formed a joint venture to let people use their checking accounts to send each other money with an email address or cellphone number. “The banks have failed miserably in capturing the person-to-person payments business,” said Mr. Shevlin, the payments analyst. 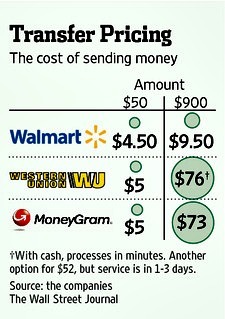 via Wal-Mart Undercuts Rivals With New U.S. Money Transfer Service – WSJ.com – Article by Paul Ziobro & Robin Sidel.